A massive earthquake rocked southwestern China on Monday, resulting in a death toll that neared 10,000 Tuesday and creating a new crisis for China’s leaders after several that have heavily tested the regime this year. The quake, among the most powerful to hit a populated area in recent years, flattened school buildings, shops and homes across a wide, mountainous area around the epicenter in China’s Sichuan province. Local officials estimated 3,000 to 5,000 people died in a single Sichuan county, called Beichuan, where 80% of the buildings were estimated to have collapsed, the official Xinhua news agency reported. The full scale of the devastation wasn’t clear, in part because of damage to communications lines in the affected area. Rain, as well as rocks and boulders blocking roads, hampered rescue efforts, Xinhua said. In the town of Dujiangyan, near the quake’s epicenter, fewer than 100 students out of 420 survived the collapse of a school building, Xinhua said. People rushed to rescue students at Juyuan Middle School. Outside the school, known as Juyuan Middle School, scores of parents huddled under tarps in the rain sobbing and awaiting news of their children. Rescuers used heavy cranes to lift toppled concrete slabs. “They haven’t found our kids,” said Wang Zhouqun, wiping away tears. Her teenage daughter was still missing. The devastation represents the latest of several crises to test China’s leadership in a year that was supposed to be dominated by Beijing’s hosting of the Summer Olympics in August. Winter storms in January — China’s worst in 50 years — shut down much of the country’s central and southern regions for weeks and killed crops and livestock, exacerbating inflation that was running at decade highs. 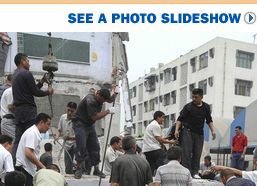 A rescuer tries to pull an injured woman from the debris at Juyuan Middle School after the earthquake. In March, antigovernment protests in the Tibetan capital of Lhasa, and the resulting government crackdown, triggered unrest throughout ethnically Tibetan areas in much of western China. Monday’s quake struck in part of that region. The Tibet flare-up fueled criticism of China’s government internationally, leading to protests during the Olympic torch relay through major Western cities, which in turn caused an anti-Western backlash in China. Following these crises, the earthquake’s aftermath is likely to be watched closely within China as a test of the leadership’s ability to coordinate a complicated relief effort — and of how it balances its own desire to seem self-sufficient against the need to request any resources from abroad that it might not have. Relief groups, already contending with the aftermath of the recent cyclone in neighboring Myanmar, said they were awaiting word from Chinese authorities on whether assistance was desired. The quake also could offer a test of China’s adherence to earthquake standards in the midst of a massive building boom, and could put local officials under pressure as well. 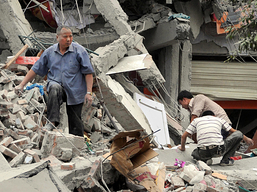 The quake, which struck midafternoon local time, measured at magnitude 7.9, according to the U.S. Geological Survey. The initial jolt was so powerful it was felt as far away as Bangkok. It prompted evacuations of offices towers in Beijing and Shanghai, both more than 1,500 kilometers away, as office buildings swayed enough to make some workers nauseated. More than a dozen aftershocks followed, many of them topping magnitude 5.0. Hundreds of people were trapped under two collapsed chemical plants in a town called, Shifang, where tons of leaked liquid ammonia caused the evacuation of 6,000 people, Xinhua reported. In Dujiangyan, entire blocks of six- and seven-story houses collapsed into piles of bricks, concrete slabs and splintered furniture. “My father died in there,” said Fu Xufen, who had rushed to check on her father after the quake hit and found a pile of rubble where his building had been. China’s leaders moved immediately to show the public they were dealing with the disaster. Premier Wen Jiabao left Beijing for the affected area within hours of the quake, and state-run media later showed images of him with a bullhorn calling to possible survivors in the rubble of a wrecked hospital in Dujiangyan. President Hu Jintao convened a special meeting of the ruling Communist Party’s powerful Politburo Standing Committee to discuss the disaster, and said relief and rescue work would be the government’s “top priority.” Tens of thousands of Chinese soldiers and paramilitary police were dispatched to the area to aid the relief effort, Xinhua said. 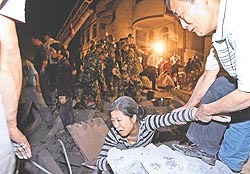 Rescuers searched for victims in the rubble of the collapsed Juyuan middle school in Dujiangyan. Analysts said China’s government is likely to assemble more effective response than has been seen in Myanmar, where the military leadership’s refusal to accept many outside aid shipments has been blamed for likely exacerbating the toll. Still, if it needs aid such as equipment and dogs to find survivors, China would need to request it quickly to be effective, aid experts said. Hours after the quake, the Czech Republic’s government offered a team of 15 earthquake search experts and their specially trained dogs, an embassy spokesman in Washington, D.C., confirmed. A statement from the Czech embassy in Beijing distributed by the Foreign Correspondents Club of China said China’s Ministry of Foreign Affairs had expressed appreciation for the offer, and promised “to study” the proposal. The Czech embassy spokesman said Monday afternoon that his nation hadn’t heard from Chinese officials about the offer. Chinese officials couldn’t be reached. The earthquake isn’t likely to significantly slow China’s surging economic growth because the Sichuan region isn’t a major manufacturing center, according to a Merrill Lynch report. Reaction from China’s stock markets was muted Monday, before word of the quake’s magnitude spread. Monday’s quake struck at 2:28 p.m. local time with an epicenter that the U.S. Geological Survey said was about 90 kilometers northwest of Chengdu, capital of Sichuan, capital of one of China’s most heavily populated provinces. Ambulances carrying the seriously injured streamed into Chendgu Tuesday morning. They passed buses of troops, earth-moving equipment and electric utility trucks heading further into quake-hit areas. With aftershocks still rolling through the region Tuesday morning, residents of Chengdu — a city of about 10 million people — huddled along the road under heavy rain, too fearful to go back indoors. On the grounds of the University of Electronic Science and Technology of China in Chengdu, hundreds of students and local residents were camped outside, some sleeping, others gathered around radios trying to get the latest news on casualties. He Rong, a 20-year-old sophomore, sat clutching her cellphone, trying to get through to her family in a city closer to the quake epicenter. “I haven’t been able to reach anyone. I am so worried,” she said. This entry was posted on May 13, 2008 at 2:25 am	and is filed under Asia Business. You can follow any responses to this entry through the RSS 2.0 feed. You can leave a response, or trackback from your own site.